Don’t go looking for the title “Red Tulip Part I”. I skipped that step. Yesterday’s post was essentially “Red Tulip Part I”, although it could also be “Red Tulip Looking Like Blue Tulip Part I”. The two red tulip anthotypes were exposed for about the same amount of time. I estimate about nine days give or take a rain day. If you look at the lower right corner, you can see that rain did make its presence known despite wrapping the “contraption” in plastic. 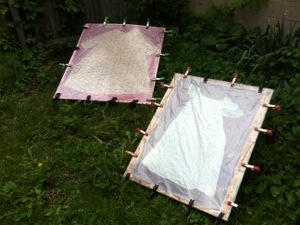 The contraption is usually a thin sheet of OSB, the paper coated with pigment, the garment, and plexiglass all held together by spring clamps. The spring clamps show up occasionally around the periphery of the finished anthotype. Bridgette has described them as giving the finished piece a rhythm. I use to hate the artifacts they left behind, now I am kind of digging them. 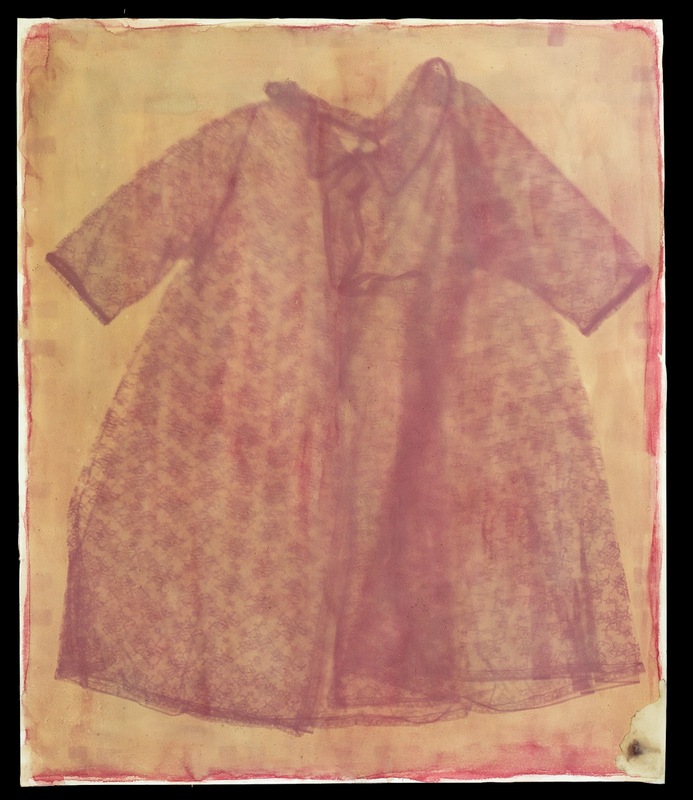 This anthotype was made with the same emulsion as the “Little Gown” anthotype but I kept the red tulip color by adding a bit of citric acid to the emulsion. Normally this paper (Arches Cover) and Fabriano Artistico have a bit of buffer that pushes the color to the blue end of the spectrum. Flower pigments act as a pH indicator for naturalists. I have even made purple iris pigment red. This is “Red Tulip (acidic) Peignoir #1”. 51″ (H) x 42″ (w). Speaking of iris pigment. I raided the last ones today. 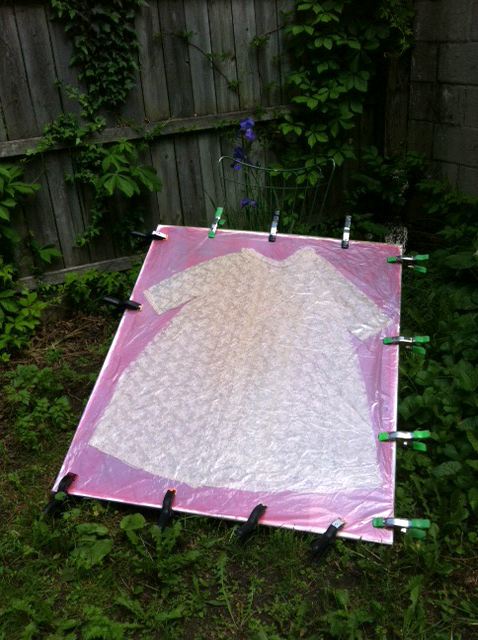 I have a bit frozen away and two sheets already coated one of which is exposing right now. I see plenty of purple gowns, peignoirs and pajamas in the future. The weeks around the summer solstice are amazing times for this anthotypist who is so used to slow emulsions and winter sunlight in the midwest. I removed the two red tulip anthotypes today and the results were more than I could have hoped for. Today I am uploading one I will be giving the clumsy title of Red Tulip (Basic) Little Gown. It is arguably the better of the two primarily for the delicate lines around the sleeve and neck areas. Yes, it is blue even though it has “red” in the title due to the buffering in the paper which has shifted the color towards a cooler tint. The dimensions for this anthotype are 36″ x 26″. 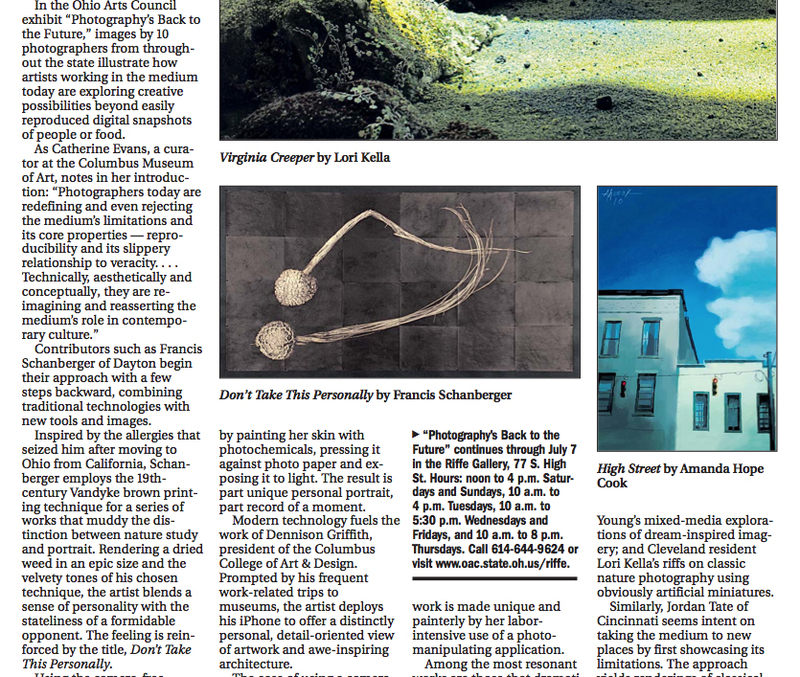 The survey of Ohio photography at the Riffe Gallery in Columbus, Photography’s Back to the Future curated by Catherine Evans, has been reviewed by Melissa Starker in the Sunday, May 26th 2013 edition of the Columbus Dispatch. Don’t Take This Personally is shown (print version only) and described in detail at the beginning of the review starting at the third paragraph! Cost: $375 per person plus $95 materials fee (for paper and gold toner). Reservations are on a first-come first-serve basis by email with a deposit of $200 through PayPal. Partial refunds will be given if your reservation is canceled no less than 21 days before the workshop is scheduled to be held and will be subject to a to a PayPal service fee. 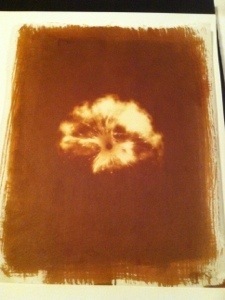 About the Process: The Vandyke Brown Print is part of the Kallitype (Iron Salt based) family of photographic processes. It stands out due to its unique printing out of an image that requires no developing agent. Vandyke Brown prints work on many papers but can create difficulties due to the amount of chemistry that gets absorbed by the paper. Careful consideration of how papers are sized and even applying a surface size can result in spectacular prints. Additionally, deep rich chocolate browns can be achieved through control of humidity and toning with precious metals like gold and palladium. An archival print is achieved by thoroughly fixing and washing out hypo, and iron, combined with toning. Workshop Agenda: In this intensive 2-day workshop, students will create several inkjet negatives for use with specific Japanese papers. Each student will learn how to deal with the challenges of coating and processing Vandyke Brown on three different washi papers. This workshop will also include a demonstration of sizing paper using the Japanese method of applying dosa, which can significantly expand the number of papers onto which photographers can print. Additionally, students will learn how to archivally process their prints as well as have the opportunity to tone their favorite prints from the workshop. Bio: Francis Schanberger is an Ohio based artist originally from San Diego, California. He first became acquainted with historical photographic processes through the workshops organized by the Museum of Photographic Arts and Grossmont Community College. His current work involves the extensive use of the Vandyke Brown Print on Japanese handmade papers (washi). These images are sometimes collectively pieced together to greatly increase the scale of work and highlight the unique qualities of washi. In the fall of 2013, Francis will be one of two American and three Japanese artists to exhibit photographs at the Japanese Paper Museum in Ino, Japan using a tosa washi paper made specifically for alternative processes by traditional paper craftsmen. 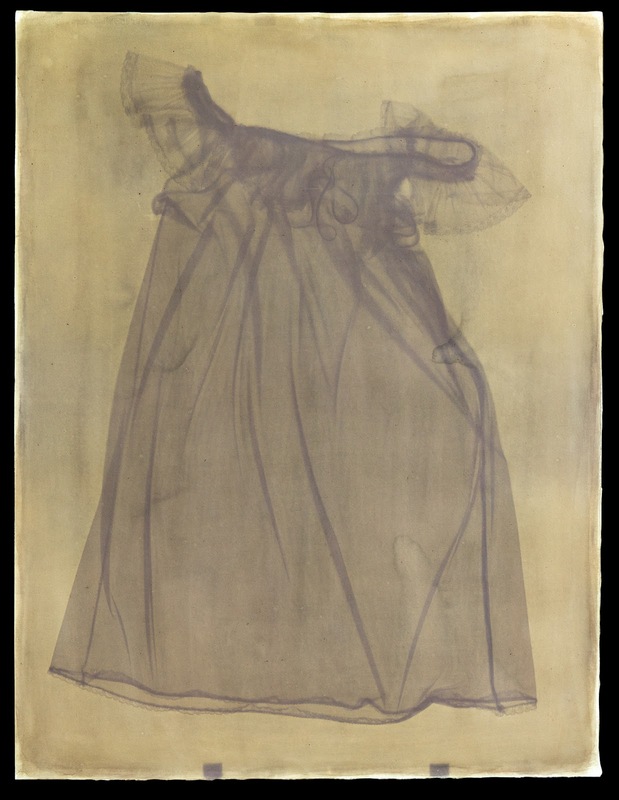 His Vandyke Brown work was recently published in Christine Anderson’s Gum Printing and Other Amazing Contact Printing Processes and is featured in Christopher James’ Book of Alternative Photographic Processes. Last year his anthotype prints were published in Malin Fabbi’s Anthotypes: Explore the Darkroom in Your Garden. Dayton: Dayton once relied extensively on manufacturing as part of its economic base. It is located in America’s rustbelt and represents one of the major metropolitan areas in Ohio. Dayton’s connection with aviation history and the abandoned manufacturing areas create opportunities for photographers unique to this part of the country. It is also the historical home of Jane Reece, one of the key pictorialist photographers outside of Alfred Stieglitz’ circle of artists. Transportation: South Park Historical District is located near downtown Dayton and is about 21 minutes from Dayton International Airport. A cab ride should cost about $40. Accommodations: There are Bed and Breakfast Inns located in the neighboring Oregon District such as Inn Port D’Vino as well as major hotels such as Marriott along the river. Next summer, very early in May 2014, I plan on teaching an Anthotype workshop. At some point last week, maybe it was Friday the 17th, the new paper from Ino Town, Japan arrived. It’s extremely lightweight and extremely challenging on every front. Here are some notes collected so they won’t get lost. The paper is about 30 gsm which is about 60 percent of the lightest paper onto which have ever printed. It needs to be sized for Vandyke Brown. It probably works for iron based processes with a coating rod. For silver / iron processes the silver will accumulate and plate out. I’ve taught myself how to work with Dosa (basically rabbit skin glue and alum). 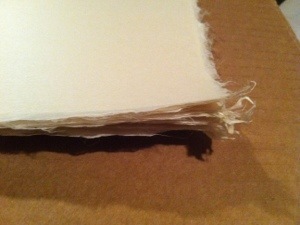 This paper does OK with just one coat on each side but will probably be awesome with two coats per side. 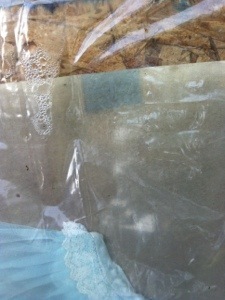 I will probably use the Dosa technique on the Kozo Unryu to solve the pinhole issue. The paper will require a new curve. 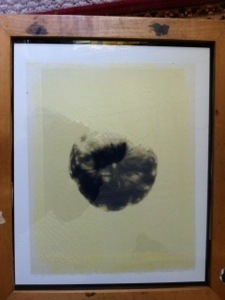 An initial print done with a Kozo Unryu negative looked posterized. 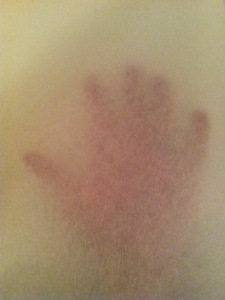 Did I mention that the paper is extremely thin? The extensive washing needed for VDB was a bit rough on my first attempt. I managed to not destroy the second attempt but will have to screen dry all of the prints. So far I have printed an 11x 14 inch size print. It is going to be a real challenge to print the 23 x 18 inch size images I proposed to the museum. 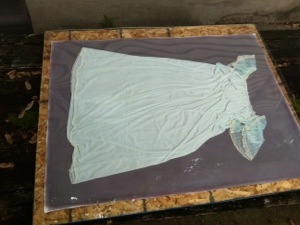 The other anthotype involves the use of a nightgown purchased off eBay from a woman living in Alabama. This anthotype also invokes the red tulip emulsion but you may notice it looks a bit like cornflower blue. I noticed in 2011 when I had access to the rose garden in Boston that a red rose emulsion would be shifted towards blue. I speculated that it was the buffering in the paper or perhaps as the emulsion oxidized it became more alkaline. 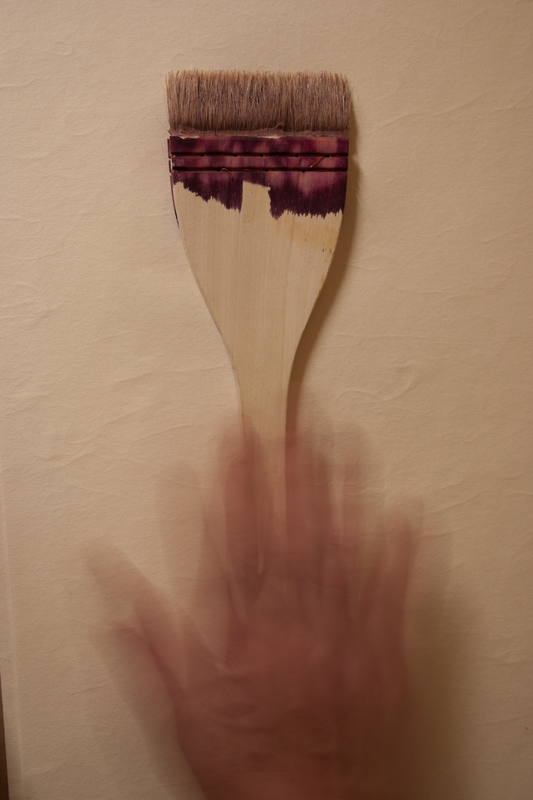 The one thing that supports this idea is the addition of citric acid to the emulsion. Instead of heading towards blue, the acidified emulsion stays red. The large peignoir antho was prepared this way. 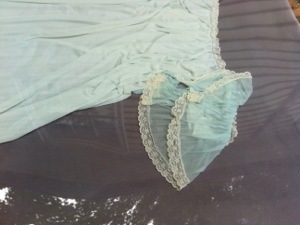 The little green nightgown was not. BTW, both show significant fading as of Tuesday and they only went out on Sunday. I am not going to reveal to the seller that I am leaving it out in sunlight for days upon days but I might mail her a snap of the finished anthotype.